*Magnesium gluconate offers a highly bioavailable soluble form of magnesium to support musculoskeletal, cardiovascular, and emotional health. Magnesium plays an important role in healthy bone mineralization. Its cardiovascular properties include support for arterial function, endothelial function, c-reactive protein metabolism and lipid metabolism. A meta-analysis of 20 randomized trials suggests that it also promotes healthy systolic and diastolic function. In addition, magnesium promotes healthy glucose metabolism. In one 15-year study involving 4,637 young adults, higher intakes of magnesium were associated with healthy cardiovascular function and glucose utilization. Magnesium also plays important roles in muscle function, mood and calming, and cranial vessel comfort. 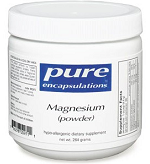 Magnesium (powder) offers a convenient soluble form of magnesium without sweeteners or flavors for wide range support. 1 scoop 1–2 times per day, in divided doses, with meals, mixed with 8 oz. water. How Toxic is Your Liver?